In Cascade Locks along The Columbia River Gorge is a place called Munra Point. Munra Point is is the ridge that you can see hikers walking on in the photo above. This hike is a bit vertical at times, unpaved and narrow but when you've made it to the top it'll be a moment you'll remember for the rest of your life. Hike with caution, a friend and enjoy the unique view of The Columbia River Gorge. Learn how to Hike Munra Point from the directions provided below. 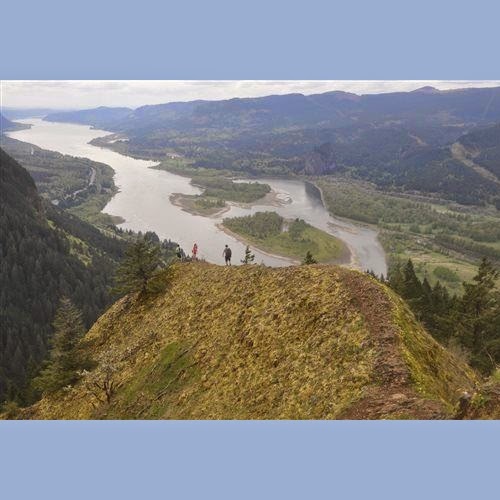 To hike Munra Point, drive to the Bonneville Dam exit No. 40 on Interstate 84. Park at the bottom of the exit, or find a spot within the dam complex, the Tooth Rock trailhead or the small parking lot for Wahclella Falls. From the Wahclella Falls trailhead, don't go toward the falls, rather hike across the historic highway bridge over Tanner Creek, then head into the woods on the well-marked Gorge Trail 400. Walk west 1.3 miles and watch for an unsigned path leading south into the forest. A long pink surveyors ribbon foretold of it last Sunday, about 100 feet before the path created by users left the Gorge Trail. Follow the path uphill to the southeast. There will be a couple of other paths and lots of braids in the trail, but just keep going up to the southeast on the obvious corridor created by users. The climb after leaving the Gorge Trail is 1,600 feet in 0.9 of a mile, which makes it very steep. This is a rock scramble, not a manicured trail hike.